It fascinates me that on a new work there is a disconnect between what is in my head – that is, what I actually see like it has been photographed already – to what I sketch or draft up, my sampling and then the finished product. Perhaps this is part of the reason why working in multiples, in a series, is so important? Is it simply a matter of working and reworking the original idea whilst searching for that perfect, photographic image of my mind? Or is it like being a mother – you can’t predict what your babies will look like and how they will end up – you can only have big hopes for their future? I suppose I have to be realistic and view that photo in my head as an impetus to explore ideas, processes and materials. To see what the teamwork of my hands, my brain, my experience, my talents and my limitations can do with the materials and techniques I chose to work with for each project. I will usually want to try again, to make a better version, to make a smaller or larger version, to make a funkier or more serious version….all to tell the story better or get it out of my head for once and for all. When starting anew there is always a hurry to get my workflow sorted – sampling at this stage of the project is such a drag. I feel like I should be able to foresee the results – because they are already in my vision. 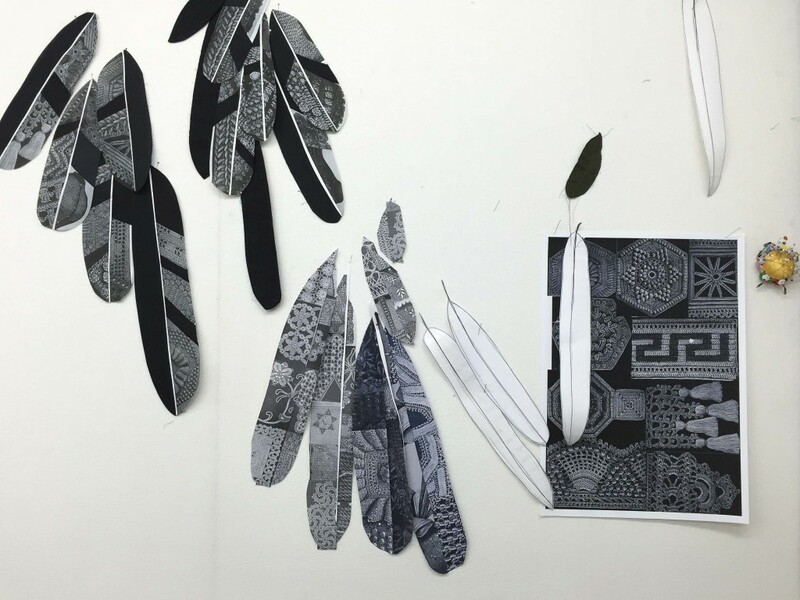 This week I am working on making feathers, of all sizes, using some of the Weldon images pieced intermittently with black fabrics. I am digitally printing on a Belgian linen (Fabrisign) which needs no treatment after printing – though it is not designed for machine washing. My printing is dense black in many areas and I find that there is residue. Steaming with the hefty iron seems to make little difference. Washing loosens a lot of ink but of course leaves the density a tiny bit short. I push on, mixing the prints with solids now, and I find the surface ink no longer seems to be a problem. These feathers are, as expected, not what is in my head – although interestingly that vision is now fading as the reality takes over. They look OK for the moment and I hope that multitudes of them will magnify their impact – that wonderful brick in a wall effect. 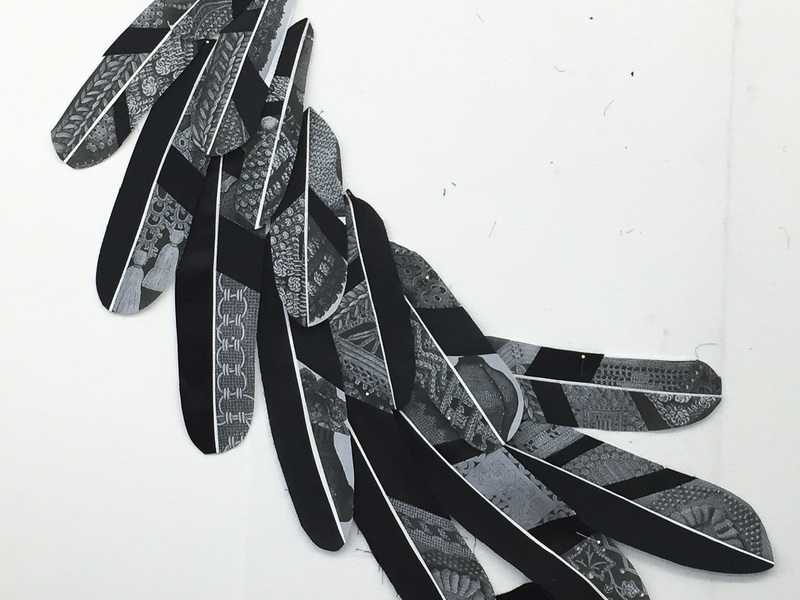 Still, I only make a few at a time as I don’t want to lose control of each feather quite yet. We are still in the getting-to-know-you stage. It is a slow and steady output that I am happy with, in a quiet way. Early in the week I buckled under the weight of waiting patterns and pushed out another. 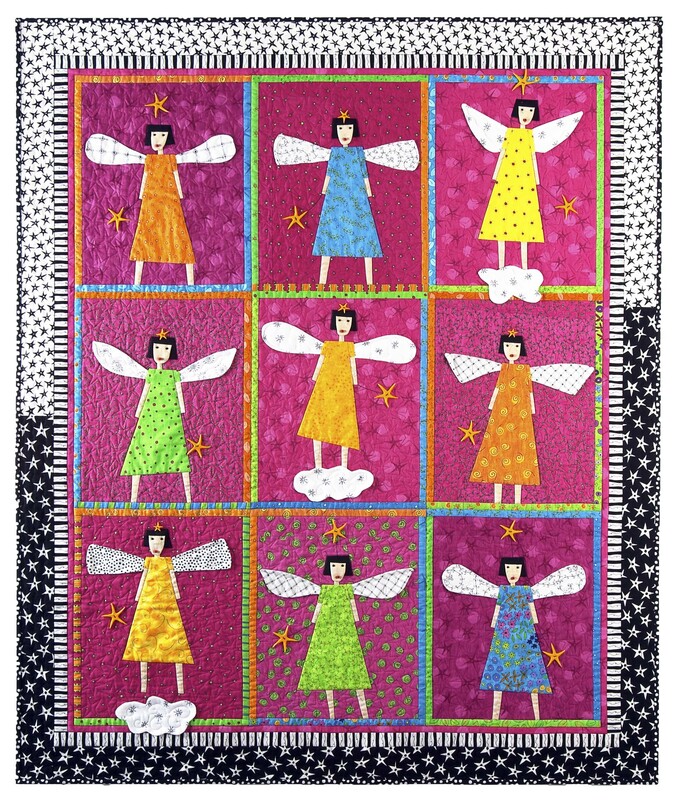 Angelz is now on Patternspot. I have a minimum of five more to go and I’m still torn continually whether to prioritise these or go full tilt on those one/two exhibition quilts. In theory the patterns can wait BUT I am holding off on two other major projects till these are done…. (big sigh inserted). The week ended with a long weekend here in Western Australia. So off to our ‘little house’ for a few days to start emptying the third bedroom ready to reline with boards then paint. Last year, our first year in this little place, we relined and repainted two bedrooms, fixed up assorted furniture, cleared out areas of the large yard, planted our ‘orchard’ and some other garden areas. The front fence was refurbished and one garage made secure. Extra accommodation was also installed/made habitable with a newly bought old caravan. This year we have been much slower. Planting and working in the garden building new beds and planting, wallpapering the ceiling of the caravan, yes!….but no other big jobs have been started until now. This third bedroom needs to get done, and the ‘lounge room’ also as we have plenty more plans for our little family house in the coming years. It’s not running out of puff its simply that same old story – lack of time!